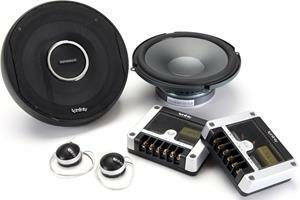 Infinity Kappa is Infinity’s high-performance line of car speakers. 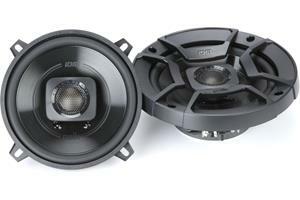 They’re designed and built to give you excellent sound, especially in an amplified system. From crossovers with Infinity-designed components inside to swiveling tweeters and strong, lightweight cones, these speakers can deliver the sound you’ve always wanted in your car. Watch as our experts show you why Infinity Kappa Series car speakers are such a popular choice when building a car audio system. 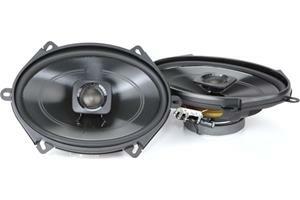 To find out which speakers will fit your car, use our vehicle selector, and we'll help you get into better sound when you're on the road. Infinity Kappa car speakers. These are Infinity's high-performance line of car speaker, and there are some really compelling reasons that make them so. First, it's a low-impedance designed speaker which simply means that it's built to coax a little bit more power out of your stereo or your amplifier than most other speakers would, and that extra power, of course, helps the speaker sound even better. As for the way it's built, we start with a hi-roll rubber surround. 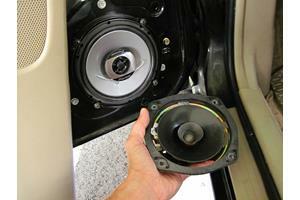 That gives the woofer cone more freedom of movement, allowing it to do its job more easily. The cone itself is made of a woven glass fiber material that's both lightweight and strong. Being lightweight, again, helps with the freedom of movement. It can be really responsive to the music, but the strength of the material makes sure the cone keeps its shape so the sound stays accurate. On top of that we have the tweeter structure. 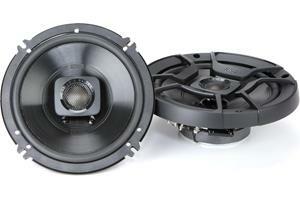 It's built with a pivoting design, so that you can adjust it based on where you have to mount the speaker in your car. If the speaker's low in the door, you want to point it upwards so that the tweeters are aimed at you. 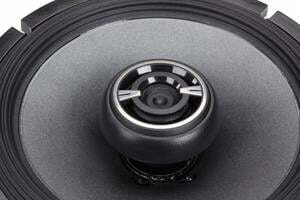 If your speaker location's a little higher, then you have the luxury of just aiming it into the cabin or still at you. But the purpose for this is to help with stereo imaging. It makes the music sound more open and expansive in the cabin of the car. And on top of the tweeter is a 3 dB attenuator switch. That allows you to fine-tune the tweeter output for your particular setup. If you're running on lower power, you might want to activate that 3 dB attenuator — cut the highs a little bit so that they're not overpowering the sound. But if you have a lot of power or a couple of subs behind you, then you're gonna want to turn that off and let, just open up the tweeter and let it deliver everything it can for you. Then we move on to the crossover. Now you don't normally get an external crossover on a coaxial speaker, but because these are built to be high-performance they kind of need it. What the crossover does is make sure the right frequencies are going to the right part of the speaker — lows to the woofer, highs to the tweeter — and that is really there just to ensure good sound. Now, power handling. These speakers really come to life if you can put them on an external amplifier. 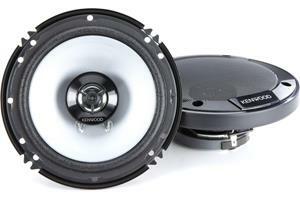 Like this 6 3/4" speaker can handle up to 75 watts RMS, and if you put that kind of power behind it you won't be sorry. It's gonna sound great. Alright, let's talk about the components. They feature all of the technology built into the coaxials that I talked about, just in separate pieces. 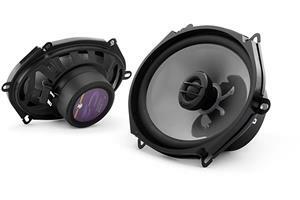 The tweeter: it's built to handle all that power in order to deliver smooth, crystal clear highs. But you might notice it's a little bit big. You're probably not going to get it to fit in the factory tweeter location in your vehicle, but that's okay. Infinity has you covered there. They include all kinds of mounting hardware in the box so that you can get this guy wherever you need it to be in your vehicle. Now for the crossover. You'll see here, inside this really nice looking box there's nothing off the shelf. These are all Infinity components. And again, that's all part of the plan to give you great sound. You'll see even the same attenuator button that we saw in the coaxials so that you can roll off the highs a little bit if you need to, or if you like it nice and bright, keep them in there. For help finding out which Kappas will fit in your vehicle, you can use our online vehicle selector or just give us a call.